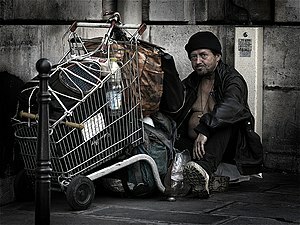 Most homeless people give up on their struggle with the system. I have seen this among people I know and feel it is a damn shame that they don’t stand up for themselves if they are right. The maze of paperwork and angry faces gets to them and they give up. If you need job training, housing, food, medical help, etc. don’t give up. But if you do ask for help, do the right thing and find a way to pull your own weight or help someone else if you are able. If you get a low-income housing unit, take care of it and don’t be an idiot blasting the stereo all night. If you get food from the food bank and don’t want/can’t use part of it, don’t throw it out, give some to a friend (or stranger!). If you get job training, do something with it. If you pound your fist on the table demanding help, be responsible after you get it. That’s all I have to say about that. When the public facade is over what do they really do? This is a great read. Very true and thoughtful. Let’s face it, there is an element of sympathy for a soul who lives ‘on the rails’ as it were; no place to call home, feeding on others leftovers, not owning a pillow, no steady job, an unfortunate identity, a ‘nobody,’ sloppy in appearance, somewhat odorous, no phone, no address, and most sadly of all, no true family. We like to think we do not know anybody like this, for that would be an indictment of our own lack of ‘love thy neighbor’ but sadly, we do in fact know a hobo or two. It is easy to confuse a beggar with a hobo, for we mistakenly put them in the category of lazy souls looking for a handout, with no meaningful differences, both being an encroachment to society, but the hobo is a man not afraid to work. Now that you have done your resume, (You did it? Great. Someone out there is reading this.) the next step is to send out the resumes and cover letters and get a response. Then comes the dreaded interview. From experience, I can tell you that interviews can range from fun, casual talks to grueling interrogations. The most important thing for you is to be on your game and prepared. Take out a blank sheet of paper and turn it lengthwise, make 3 columns. The first is “Strengths” next is “Skills” next is “Work Experience”. In the Strengths area write down all the positive qualities you possess. It will help to get one of those resume books that have a list of words to describe your character. Pick some out and write them down. Remember the good things that former employers had to say about you. It would help if you focus all your strengths on what your employment goal is. If you are looking for a job in human resources, mention strengths in team building and leadership. You get the idea. In the Skills area, think about how you used your strengths in your work. A positive attitude is a strength that leads to a skill as a good sales person. Think hard about how you used strengths such as: Detail-oriented, hard-worker, etc. And remember strengths are innate (personal qualities) while skills are things that you have learned to do. In the Work Experience area, think about how you applied your skills and strengths to your job. List each job separately and fill in each skill and strength that applied. How about those other questions, you know the ones ment to trip you up? You have to think about these ahead of time. “What are your weaknesses?” Avoid the deal breaker answers. No mentioning memory lapses when you are trying out for a job as an event planner, etc. Just talk (briefly) about a little flaw you are working on. Mention the improvement you are making and keep it light. This is not psychoanalysis, no one expects you to be perfect… just keep it light. There are some great books out there about interviewing. One of the best ways to prepare for an interview is to make sure you are trying to get a job that you will really love to do. This will make all the difference in your presentation and attitude. Right after Independence Day the crews came out to trash homeless camps is the downtown area. When is some advocacy group going to find a patch of land so these people can set up their tents. Throwing away homeless people’s belongings is not the answer folks. You could tell he was different the moment he walked in the coffee shop. It wasn’t his appearance. He looked presentable, if a little rough around the edges, clutching an old BlackBerry to his barrel chest. It was how he moved: warily, shoulders hunched over and eyes darting. The body language would read as suspicious, if not for the flicker of fear and apprehension in his eyes — as if he was scared of being noticed, vigilant to his surroundings and desperately trying to blend in at the same time.